Join Cate and Sarah during their volunteer hours: Tuesdays from 9-12 and Wednesdays 11-2 all summer long behind the Wysocki House at 911 North Pleasant St., Amherst, MA. It was a grim task, pulling up 400 tomato plants tainted by blight’s black, contagious lesions. Seven 20-something men and women at a garden at the University of Massachusetts in Amherst were untying the strings holding the fruit-laden vines to their stakes and stuffing them into big plastic bags. “It’s heartbreaking,” said Sarah Berquist, as she watched one of her co-workers close up a full bag. “But it’s pretty prominent around here.” Blight, which spreads through the air, can wipe out acres of tomatoes. 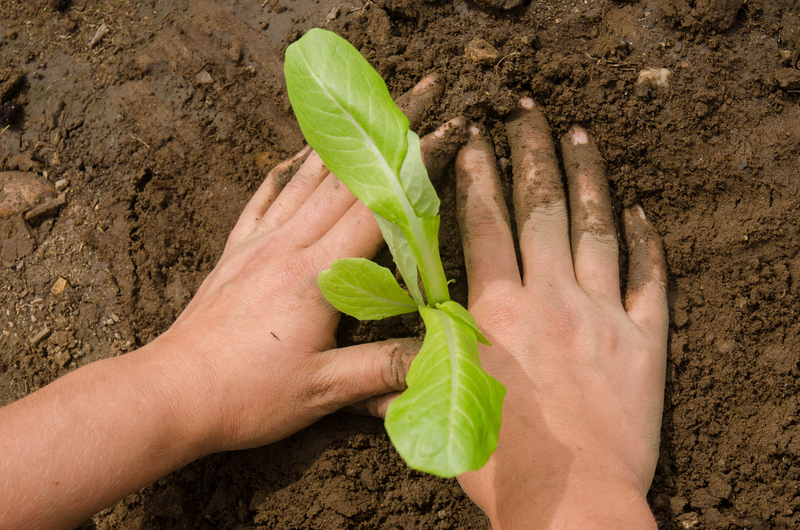 Protocol dictates that infected plants be removed and discarded as soon as the condition is detected. “We don’t want to be in incubator for the disease,” she said. 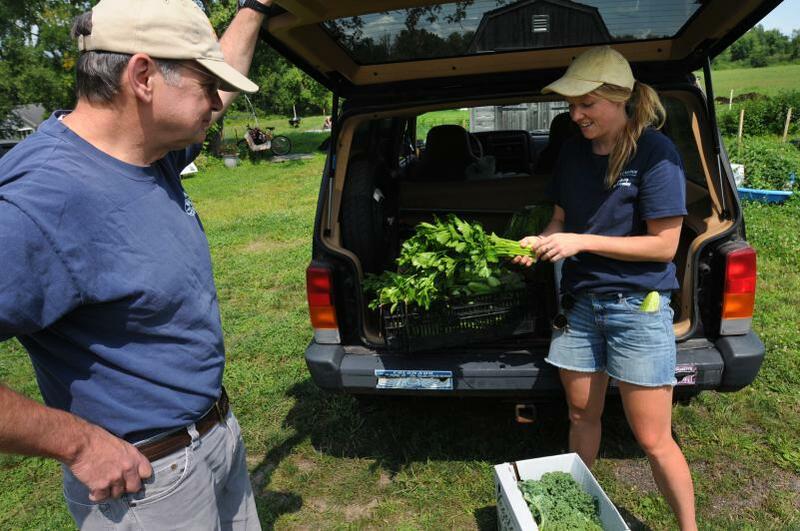 The tomatoes are just one of a number of crops UMass students Berquist and Cate Elliott, managers of the one-acre plot, are growing to donate to Amherst’s Survival Center and the Not Bread Alone soup kitchen in town. So, they were taking the task philosophically — more room now for fall beets, carrots and cabbage. 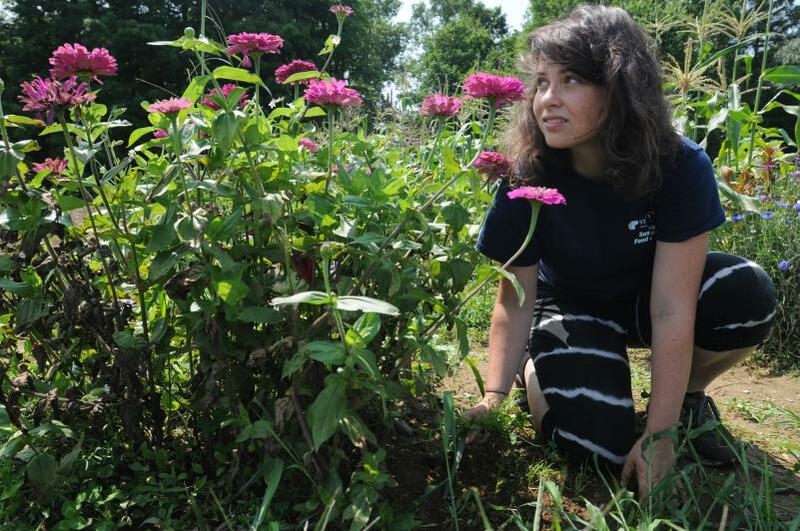 They were out that recent Tuesday morning with five members of the UMass permaculture team tending the crops during a time slot reserved for community members to pitch in, too. None, though, had shown up that day. The project is called Food For All, and Berquist and Elliott had already turned over kale, basil, lettuce, celery, broccoli and cucumbers to the two programs which provide free community meals, as well as groceries, to those in need. They also have spinach, beans, corn, squash, onions, beets, potatoes, herbs — medicinal and culinary — and pumpkins growing. They are proud of the step they’ve in the effort to promote local crops. “It’s rare to be growing food specifically for donation centers, so it’s kind of an innovative twist,” said Elliott. She and Berquist met with folks from the Survival Center and Not Bread Alone at the beginning of the growing season to make their plans. Knowing both places get donations from various sources, they asked where the gaps were: why grow turnips if they already get plenty? Tracey Levy, program director for the Amherst Survival Center, is pleased with the results. But there is a second part to the project that she likes just as much. There are hours set aside each week, like that Tuesday morning slot, for volunteers to come to the garden behind the former Wysocki farmhouse at 911 North Pleasant St., and work alongside Berquist and Elliott. Or they can just sit at a table shaded by an umbrella and watch. “You can see it’s beautiful here,” said Berquist, her blond hair pulled back under a beige ball cap. “Two red hawks live here,” she said squinting up at one flying over head. Visitors can park in the lot there near the farmhouse, now used for office and meeting space, and walk up a short gravel path which leads to the lush fields known as the UMass Agricultural Learning Center. There are experimental gardens — one USDA project on Japanese Knotweed is on the right. Displays for urban gardening are on the left side where vegetables grow in blue plastic wading pools and ceramic containers. In the distance you can see a UMass student garden, a large plot of vegetables which are sold at a campus farmers market. The Food For All garden is on the right and visitors are greeted by a sign which posts the volunteer hours — Tuesdays and Thursdays, 9 a.m. to noon and Wednesdays, 11 a.m. to 2 p.m. But Berquist and Elliott say they are glad to try to arrange alternative hours, too. Elliott, 21, a senior in the sustainable food and farming program that Berquist, 25, finished before starting graduate studies, got college credit to design the garden. It was the idea of John Gerber, a professor at the UMass Stockbridge School of Agriculture, and Shelly Beck, pantry coordinator at the Survival Center, took part in the planning, said Berquist. Beck was involved in a similar garden in Greenfield. Aside from Food For All, UMass has five campus permaculture gardens — plots of crops that thrive off one another in a variety of ways — supplying the dining commonses, and the idea was to create one aimed at the broader community. Helping to stock programs like the Survival Center and Not Bread Alone also gives students a chance to see a side of the food system that is new to them, said Berquist. “You can be at the university for four years and never set food in the community that you are a part of,” said Berquist, who also works in educational gardens at two of Amherst’s elementary schools — Wildwood and Fort River. The Food For All project includes free workshops and events for the public. There was a kick-off celebration July 27, when about 20 people showed up on a rainy Sunday to tour the garden and help plant late-season eggplant and peppers. On July 30 there was a potluck supper at the Hitchcock Center for the Environment in Amherst during which a panel of educators, farmers and community organizers discussed local food sources. Next up is a session on food preservation at the kitchen used by Not Bread Alone at 165 Main St., Amherst Aug. 18 from 5 to 7 p.m.
“We just want people to take advantage of the opportunity to come together and grow food and share food,” said Berquist. The garden that Elliott designed has an 8-foot wide path, covered with woodchips, running down the middle. It’s wide enough for two wheelchairs to pass one another. Lined by a thick border of sunflowers, it leads to three folding tables on one side that contain pots filled with onion, thyme, basil, squash and cherry tomato plants for people to tend without having to walk or bend over. The workers had been at it since 9 a.m. and shortly after 11, Berquist called them to the side of the garden for a stretching break and then a snack of pomegranate and black pepper chips. The chips got mixed reviews, but spirits were high. Debra Scherban can be reached at DScherban@Gazettenet.com. 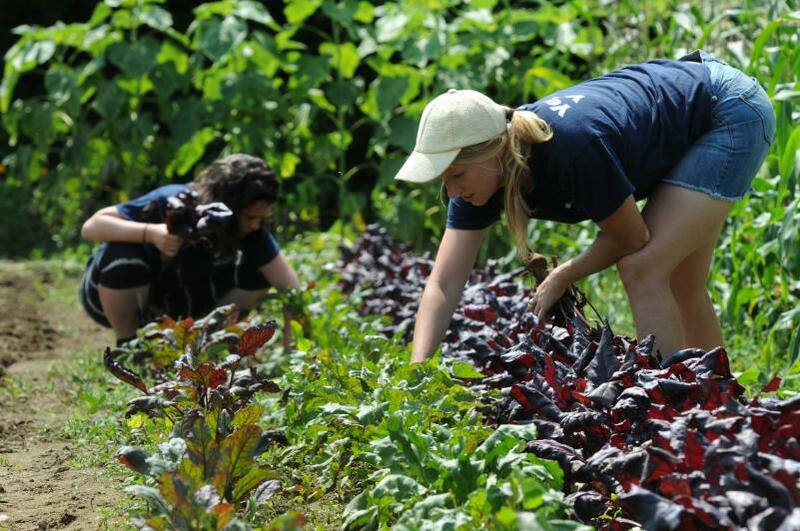 Click here for information on the Bachelor of Sciences degrees in Sustainable Food and Farming at the University of Massachusetts Stockbridge School of Agriculture. 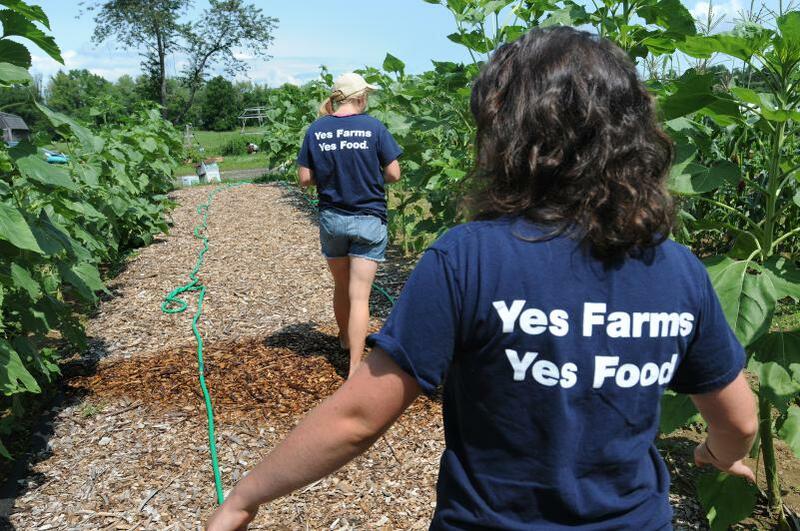 Or… take ONLINE classes in Sustainable Food and Farming and earn a UMass Certificate. Previous PostWorkshop series focuses on access to local food and food justiceNext PostMore young farmers are needed!